Canada Water to the City. Report by ride leader Werner. 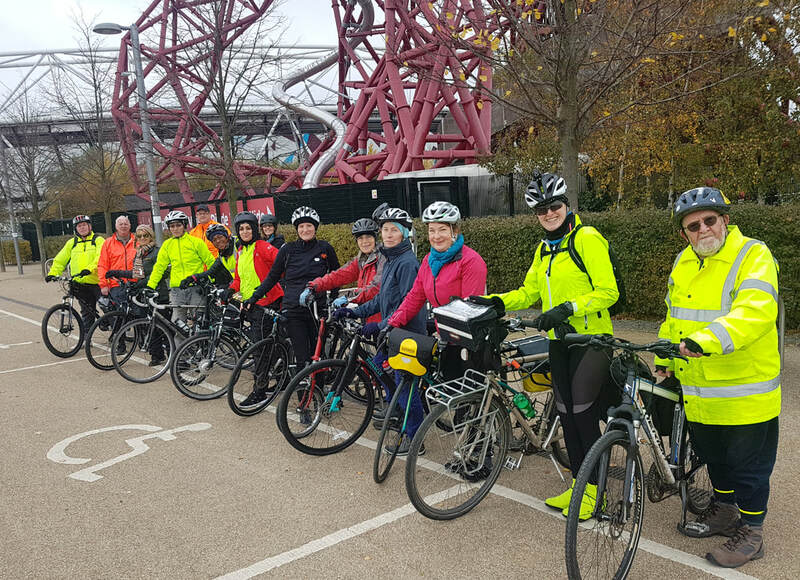 Nine riders assembled at Canada Water for the last healthy ride of the year. 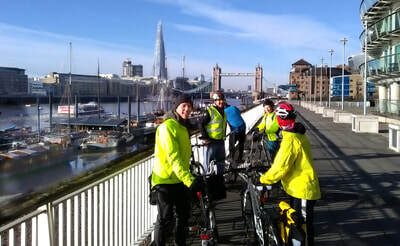 All the rain had come down the previous night and we enjoyed brilliant sunshine on the traditional Boxing Day ride. As in previous years we headed towards a quiet City along the river and over Tower Bridge. Bloomberg building to point out the Mithraeum, the restored and reopened temple, and then to ride over Watling St (although it's been resurfaced since the Britons first established it). Around St Paul's on normally very busy roads and down Ludgate Hill we reached Blackfriars Bridge. We then picked up Q14 only to see it terminate inconveniently after Borough High Street. Our alternative was to go south and follow Q1 for a bit before heading back to the river and the familiar return route to Canada Water, which we reached at 11:58. 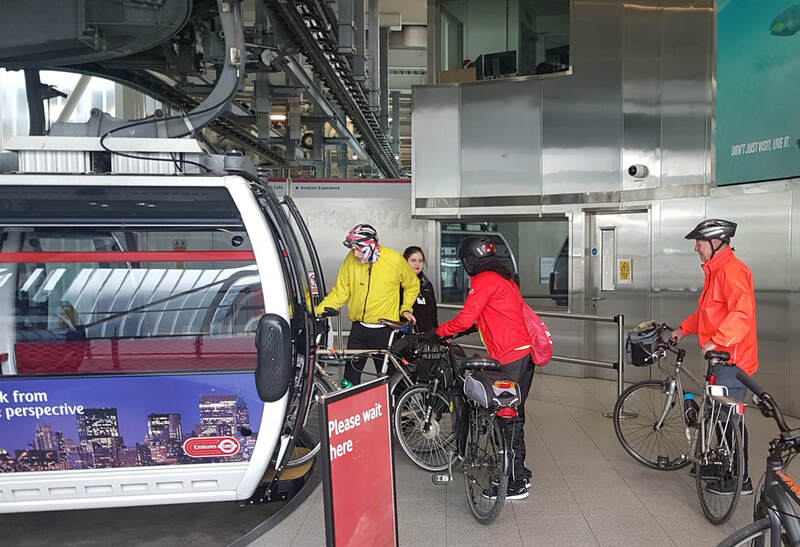 Report by ride leader Amanda. A change to our original listing due to the closure of LMNH in Old St. 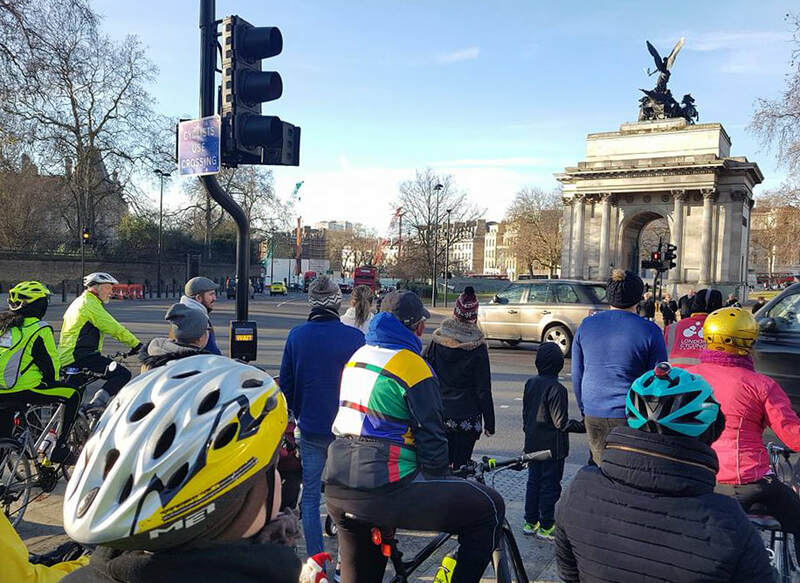 Well-informed healthy riders had contacted us to point out the early Christmas closure of Look Mum No Hands (LMNH) a bicycle riders pit stop in Old St. So we changed venue to another, Rapha at Spitalfields Market. 19 (including a little toddler riding tag-a-long style) of us set of from Peckham down the canal path to Burgess Park. The weather had been a bit drizzly earlier but paths were drying and it stayed dry for the duration. It was warm enough for Jane to wear her ¾ lengths. 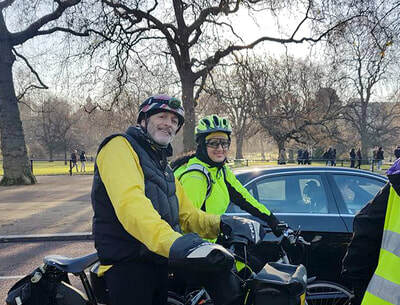 We cruised around the outer rim of Burgess Park past the pond and then took the first exit out, crossing Albany Road over into Bagshot Street. 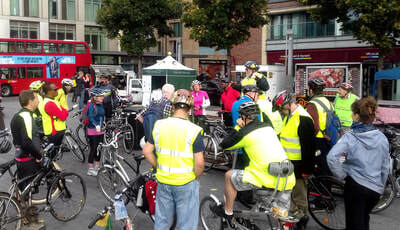 We followed the clearly marked cycle route through the Walworth Estate and crossed Old Kent Road into Falmouth St. 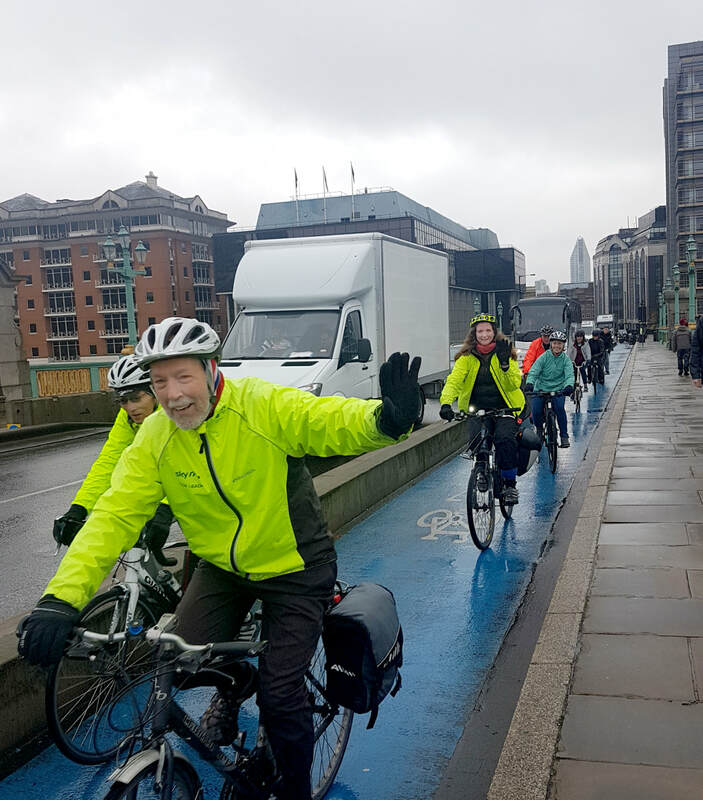 Connecting with Q1, then CS7 and Q11 over Southwark Bridge. 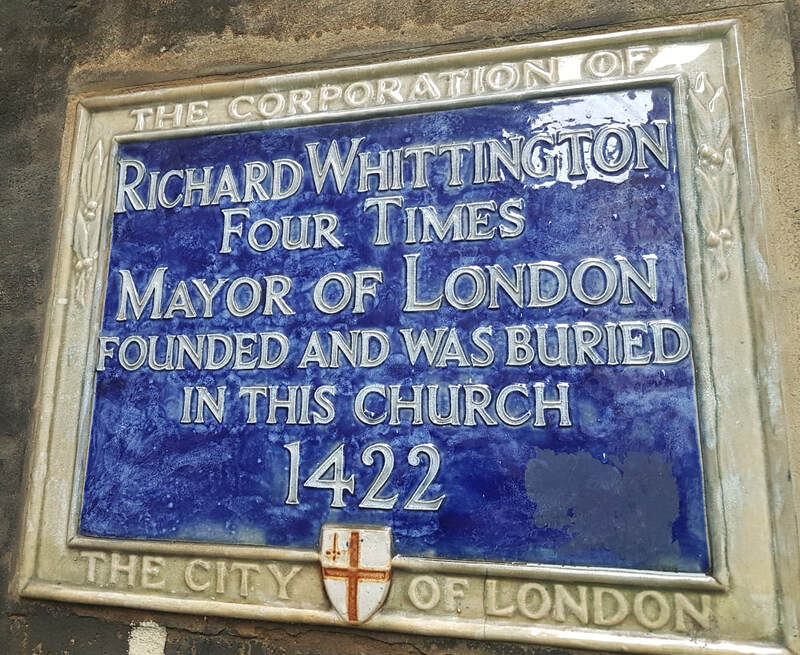 Turned right at Guildhall and, made a diagonal straight along Lothbury / Throgmorton etc towards Bishopsgate. We had intended to go behind Liverpool St (along Sun St) to join up with Primrose to go straight over Bishopsgate (safer for the group) but Crossrail hoarding blocked us. A short crossing along Bishopsgate from Liverpool Street over to Artillery Lane,. 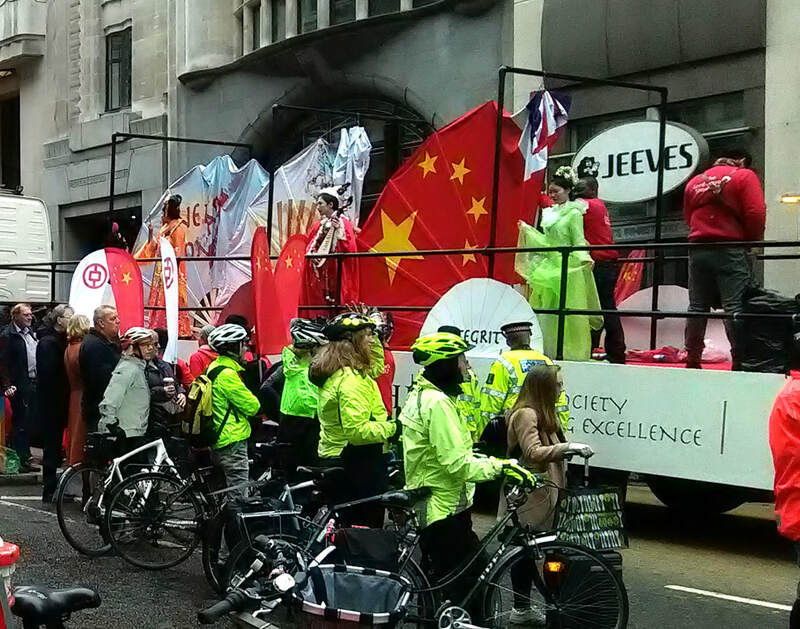 Amazingly we all got over in one go, traffic was unusually quiet here, even in front of Liverpool St station. We arrived at Rapha along Brushfield St.
Rather a long coffee stop delayed our ½ hour short return to Burgess park. Return was east of Bishopsgate, starting from Ford St with a meander running parallel with the main artery. We passed a couple of points of interest, Leadenhall Market on the Right, Damien Hurst ‘Temple’ on the left, down to Monument, where I thought as we have a little one, we are better off using CS3 along Lower and Upper Thames St’s, then back over Southwark Bridge, sticking with well known and marked cycle routes rather than wrestling with what could be aggressive traffic over London Bridge. At this point we returned the way we came, still cruising along at ‘chatting’ speed, arriving back safe with no incidents, punctures or the like at 12.13 (oops!). Really pleased to note that all of the contraflow sections we travelled along are no entry for vehicles, except bicycles. 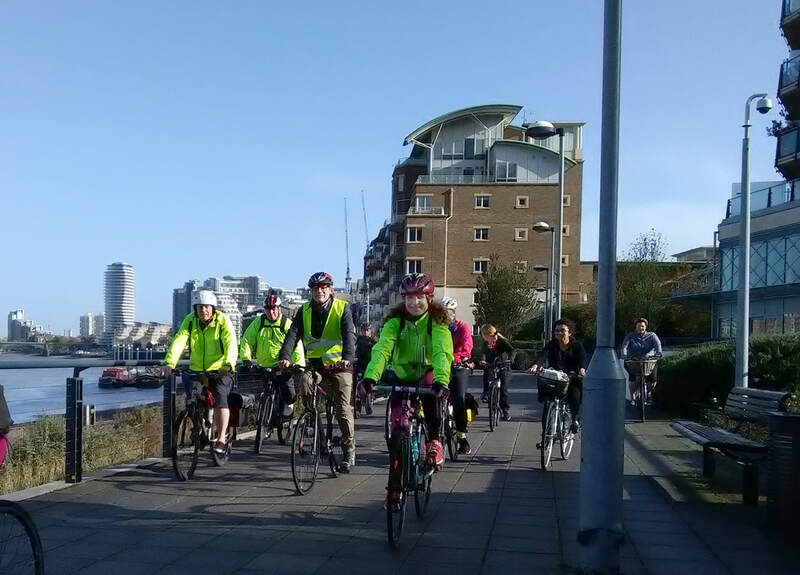 This made it an especially enjoyable ride through the city, both east and west with no traffic blocking our route and splitting the group. Thanks to Pete ‘the Pap’ for the photographs. Harry as wingman at road junctions where necessary. David for back marking and, of course Bruce for another brilliant year of organising the whole group, calendar, website, notifications etc. Burgess Park to Kensington/Design Museum. Werner leading; here is his report. 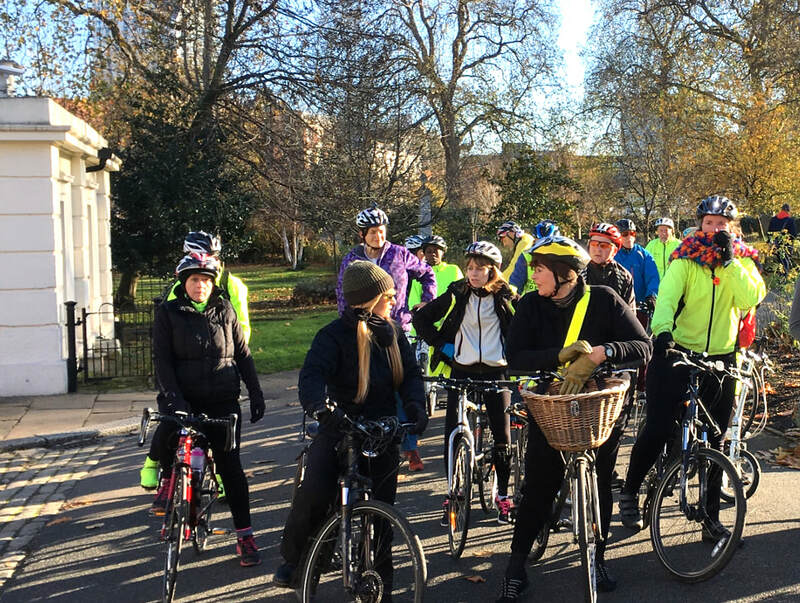 A respectable number of 20 cold riders assembled in sunny Burgess Park for the last +-ride of the year, some of them may have been tempted by a chance to pop into shops in the West End to get that last present. entrances to make that easy. That allowed us to stay on quiet streets and do the Lambeth Walk (sorry), esp. as route checks had helped to gain the confidence that despite the prominent no-entry signs there were legal gaps for us. A lovely segregated lane past Tommy's onto Westminster Bridge, which bypasses the roundabout, is almost complete, the only bit missing seemed to be the removal of the barriers. Less progress on the other side, the lane along Birdcage Walk with the shortcut in front of the palace wasn't ready, we instead enjoyed the full width of the Mall in glorious sunshine and got to Hyde Park Corner early enough to miss the Winter Wonderland pedestrian congestion. 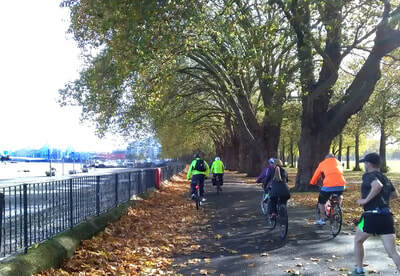 Just in case the pedestrians were streaming along Rotten Row we picked CS3 and noticed that it gives a better feeling of the landscape, you appreciate that you leave the valley of the River Westbourne, esp. if a westerly wind is against you. Through Kensington Gardens and Billionaires' Row (how many are there in London) we reached our half-way point, the longed for hot coffee in the wonderfully warm Design Museum. Nobody refused to get out into the cold after the break so we set off for the return leg of the ride across High St Ken into South Kensington and past Imperial's Queen's Tower. 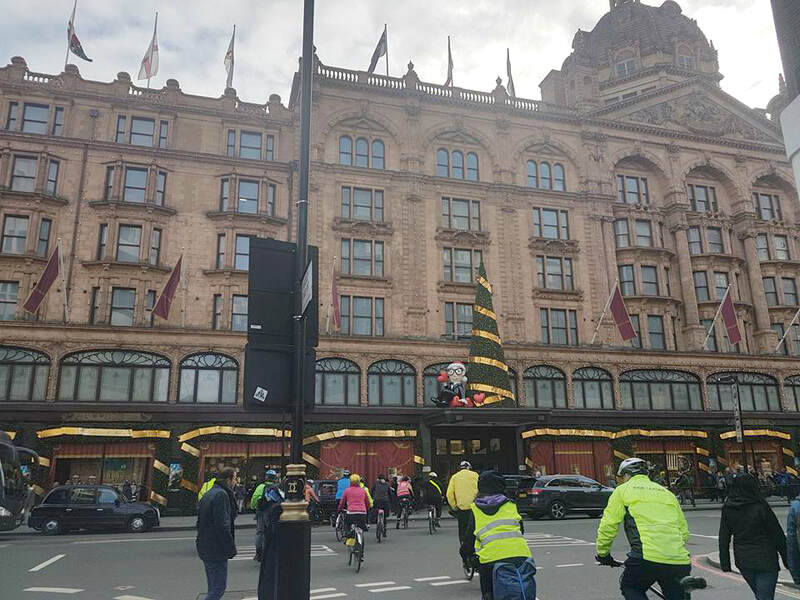 We carefully avoided some No Cycling signs, which otherwise could be unjustified obstructions of useful routes, walked down a few steps through a hole in the wall and got a sight of the Christmassy Mecca, Harrods, seasonally decorated and garlanded with a chain of cabs complete with matching impatient cabbies. Some squares with private gardens and high-end shops on the Cadogan Estate took us to Peter Jones and a busy King's Road with an award-winning restaurant waiting for its opening next year. 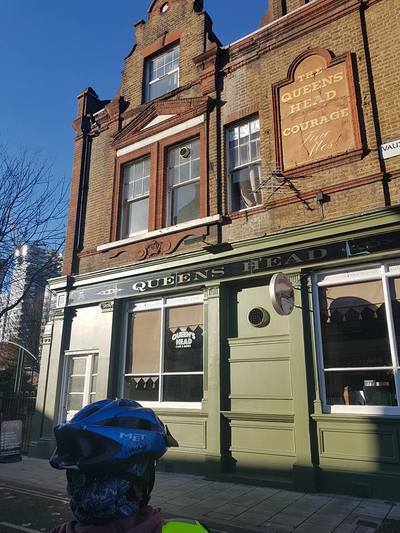 We picked up Q15, which provides a useful route through an area where drivers are convinced the price of their expensive cars included the road. Signage could be better, we were sure there is a contraflow along Holbein Place but less confident that oncoming traffic had been informed of our presence. Somehow we got through the traffic around Victoria Coach Station and found CS5 to bring us back over Vauxhall Bridge to the right side of the river. 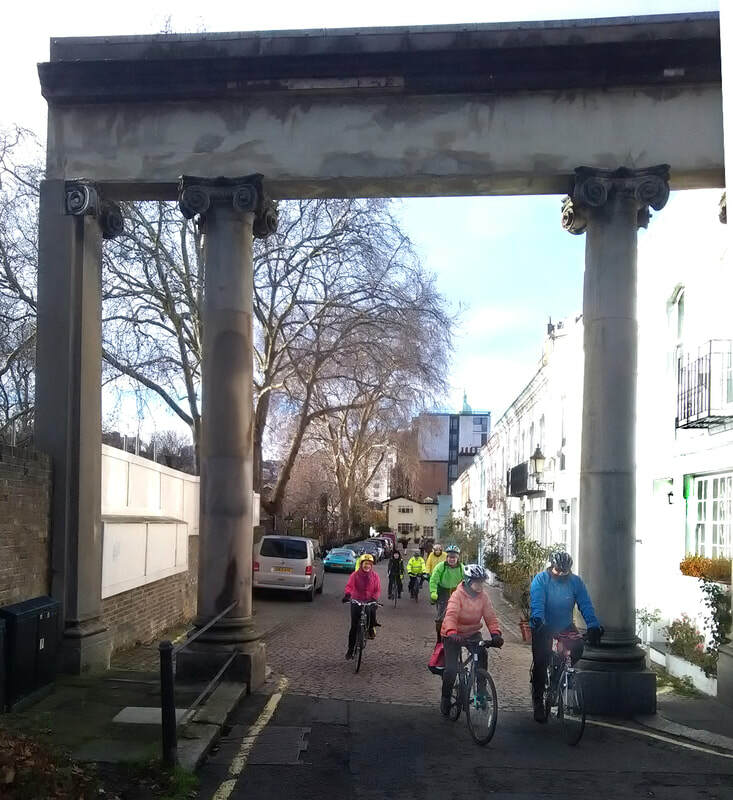 A nice clockwise quarter lap around the Oval and a short bit along a quiet Kennington Rd into Kennington Park from where we quickly reached the finish. Not quite a full-value ride, we got back a good 10 minutes early. Maybe it should be seen as paying back time for overrunning the Lord Mayor's ride in November! Dec 2nd, 2017. Amanda led this ride and wrote this report. 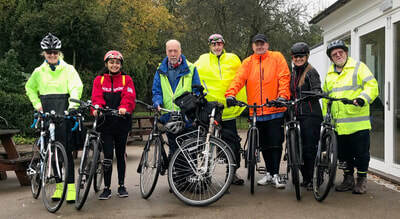 13 of us left the park for the first of this year’s December rides, out for a 10 mile circular trip to Crystal Palace Park. Aiming to see the completed renovation of the Dinosaurs. No rain or wind forecast. 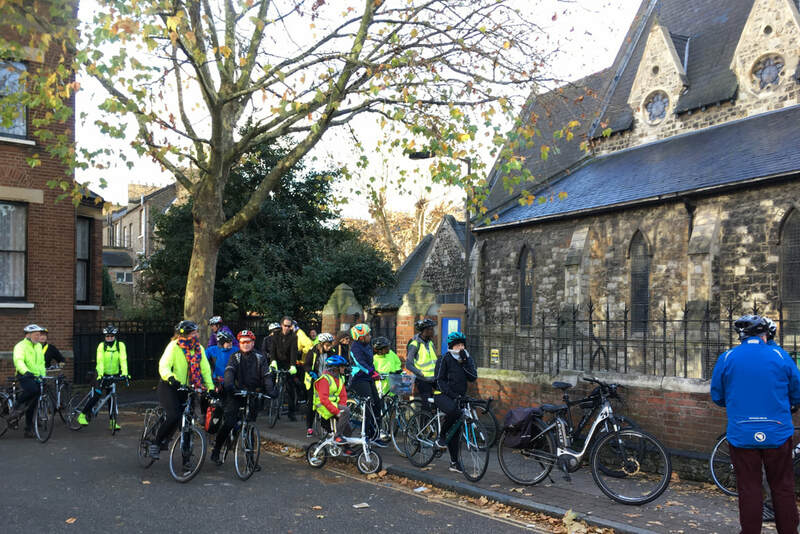 We set off leaving the Park heading for the top end of Peckham Rye Park to join NCR22 through the ridge and valley sections of Nunhead & Crofton Park. 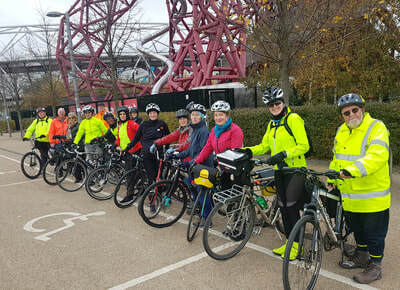 We picked up NCR21 in Ladywell Fields, cycling along Waterlink Way beside the Rivers Ravensbourne and Pool to Penge. Bruce got a puncture at Lower Sydenham but requested the group to continue as he would catch us up. Reaching Cator Park we then went roadside along Lennard Road picking up the NCR27 around Penge East Station and into Crystal Palace Park. The group had been warned of three sharp inclines in the park that would take us to the upper road level, these were spread out evenly but, as they are short and sharp many had the opportunity and preference to walk up them. 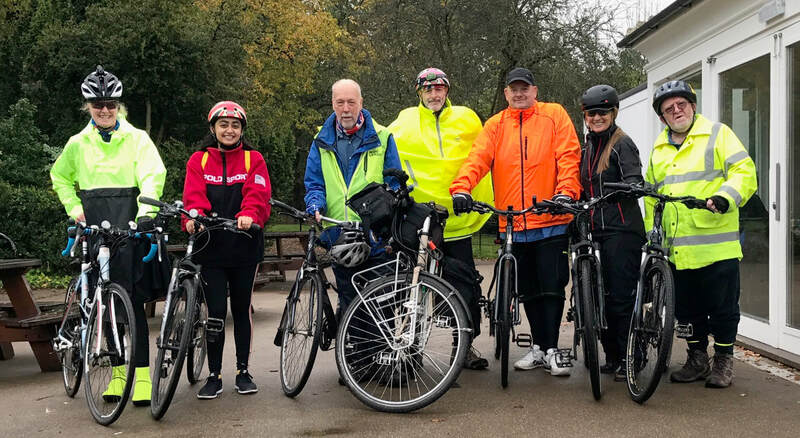 The group was a bit straggly on the outward journey getting to the park as the dilemma was between going at a brisk pace - preferred by most to stop them getting cold, or, by going at a slower pace - keeping the group more compact. What happened was that we went at a brisk pace but stopped after all turns and inclines to keep all together as much as possible and to give all the opportunity to rest and drink, before continuing. Those wanting the faster pace, took the opportunity at these stops to do warm up exercises to stop them getting cold. The general pace was an average of 7.5-8mph. Once into the Park and encountering our first incline up to the lake, a mad loosely muzzled dog bit my leg. I was more worried about my trousers being torn than needing a tetanus! We went around the outer ring and had our photo opportunity with the dinosaurs. One had extraordinary white painted toes. Would a dinosaur who walked on the dry earth have had toes this colour? We continued on through the mid-section of the park, up our second incline and whilst resting encountered the mad dog again bothering someone else this time. The third and final incline took us out onto Crystal Palace Park Road. All hills were finally over and it was sheer delight to go down, down, downhill, along the delightful College Road, including the free toll for cyclists, before entering Dulwich Park on the right. As we arrived 13 minutes early, many decided to do a circuit of the park before reaching our stop point. It was on this circuit that Bruce rejoined us. All arrived back safely. On reflection I think it was slightly more hilly overall than anticipated, so next time it may be better to cut out the Nunhead dips and spend longer in the park going at a slower pace through it. Thanks to Philippa and Pete for taking pictures. Plus Bruce for the Group Organisation and, David for Back Marking. Route https://goo.gl/rfUzwn. A super gathering of 25 cyclists for the Charlie Chaplin themed ride led by Harry. Bright and sunny at Peckham Square, but very cold. Harry was in theme with bowler hat and CC-type moustache, dishing out copies of his ride notes (see link below). 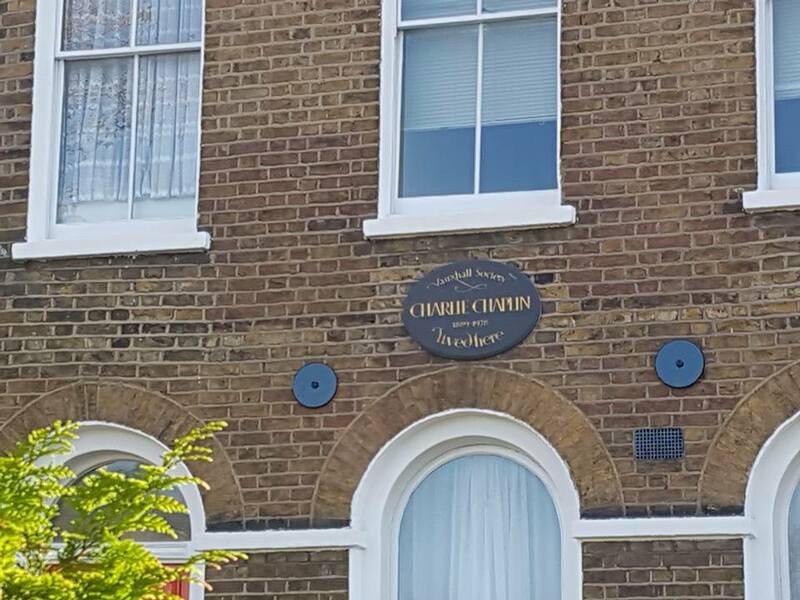 Down the Canal Path and across Burgess Park to East St where Charlie was born. Then on to St John's Church where his parents were married. Next the Imperial War Museum which was previously the Bethlem Hospital. This hospital gave rise to the word "bedlam", so it was probably not a good place to be in. Onward to the Cinema Museum, which in Charlie's time was the Lambeth Workhouse. In fact only the administration block survives. This is large - so the whole workhouse must have been a very substantial operation. None of this soft Universal Credit in Victorian times. 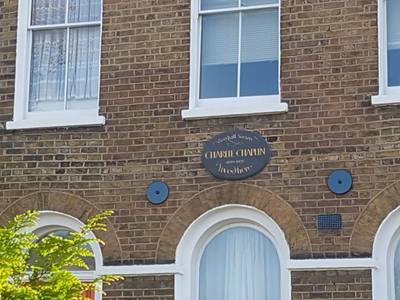 As a seven-year-old Charlie must have had a tough time. On a little further to Black Prince Rd where Jane informed me we were in part of the Duchy of Cornwall. This part of London, then the Manor of Kennington, was given to the Black Prince when the Duchy was created in 1337. Much has been sold, but not all. In fact Prince Charles is the proud owner of the Oval Cricket Ground to this day. The reason we were at Black Prince Road was the Queens Head Pub, run by Charlie's uncle . See Harry's notes for the significance of this still thriving premises. Next through Vauxhall to Vauxhall Park where we were met by Harry's father and his dog, Sandy. Could not stop long though, as time was passing. Fortunately Harry had a nice direct route back to Peckham via Vassall Rd, Bethwin Rd and Burgess Park. Fascinating ride with enough cycling to keep us warm. Many thanks to Harry, and also to Simon who took the tail and kept the quite large group together. Also thanks Harry and Philippa for the photos. Details about CC and the places we visited in the document below. If you are reading this but did not make it for the ride, why not use the notes and the map to do it yourself? Philippa leading. Here is her report and photos. 16 of us set off from the Cutty Sark taking a shortened route to the Thames pathway and along to the O2 where we boarded the Emirates Air Line. Great opportunity to take photos. 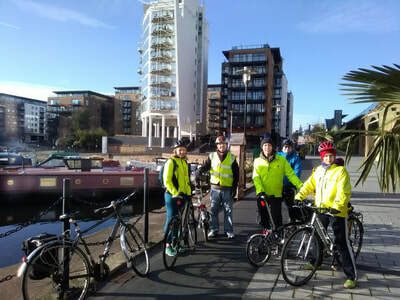 On disembarking we headed up towards the Olympic Park, crossing a couple of parks and taking a ramp up onto the Greenway. 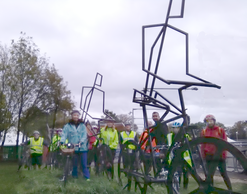 We paused for a group photo at the Arcelor Mittal Orbiter then ride onto the Timber Lodge for our coffee stop. 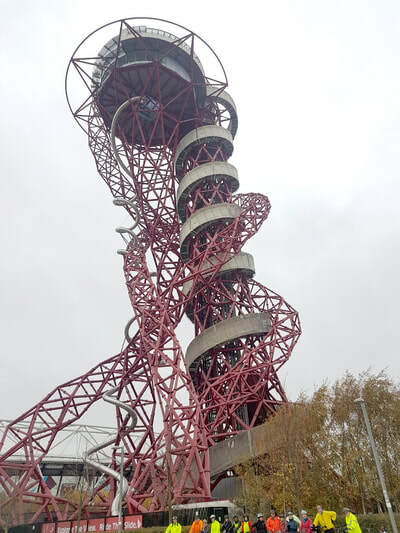 Rain greeted us as we emerged but undeterred we got our wet weather gear on and completed a quick tour of the park going past the Velodrome, Copper Box and up round the stadium exiting by the View Tube. Return route took us down to Three Mills, over Twelvetrees Crescent Bridge and along the south Lea path to Cody Dock. 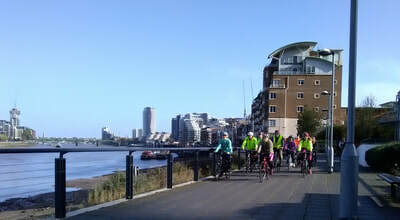 We then cut down to Dock Road and picked up the northside Thames pathway and back to Greenwich via the foot tunnel. Track (most of it at least) in file below. 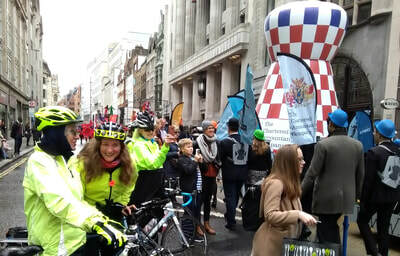 Werner's annual ride to take advantage of the closed roads in the City before the procession gets under way. 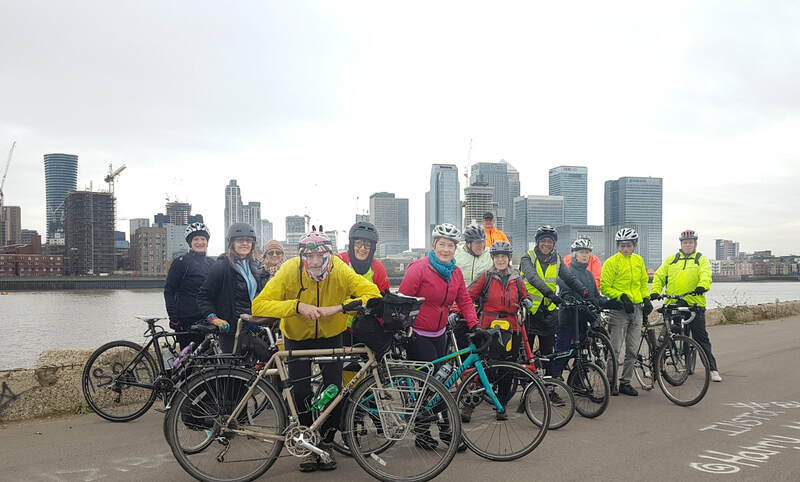 Rain stopped by 10am (just) and 16 riders headed off from Canada Water over Southwark Bridge. 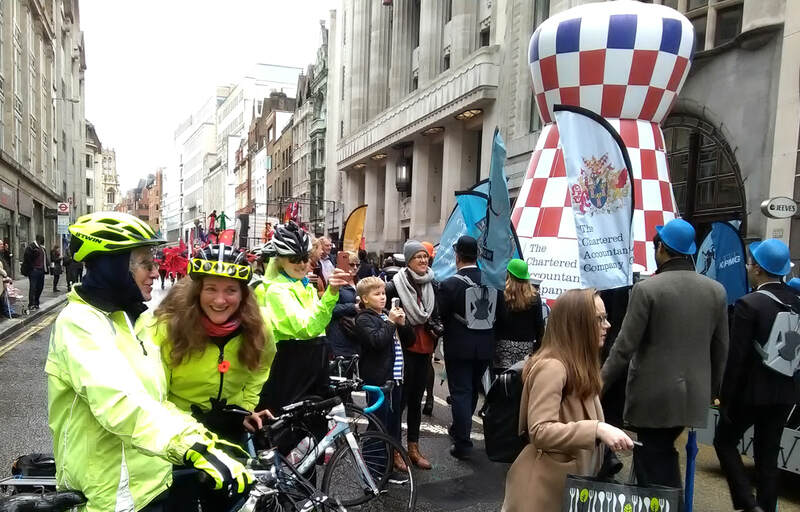 Usual fun and games, but did get to ride traffic free on several streets with the co-operation of friendly security people. At start, in assorted waterproofs. Well, this sorted then out! A very wet forecast, and light rain with a few heavy bursts early on. Only 7 healthy riders ventured out, wearing an array of waterproofs. As is often the case, fortune favoured the brave. Although there was one spell of heavy rain, for most of the time rain was light or absent, and the temperature was quite mild. Headed out of Court Lane gate, then down Crystal Palace Rd, Rye Lane, Canal Path, brief bit of Quietway 1 and on to Jamaica Rd at Dockhead. Brief stop to imagine how cycling will change in Jamaica Rd with the proposed Cycle Superhighway 4, under consultation at the time (https://consultations.tfl.gov.uk/roads/cs4/?cid=cs4 and until Nov 19th). Through back streets to Potters Field beside Tower Bridge. Stopped beside the new Bridge Theatre, which was declared a great success by me. Return route headed down Bermondsey St, through to Q1 again, then Marcia Rd, Surrey Sq Park, all the way across Burgess Park to Edmund St, and through to Camberwell Grove. Stopped at the rail bridge, currently shut to motor traffic due to structural weakness. Southwark Cyclists had campaigned at the recent consultation for this to be kept closed and Cambewell Grove modally filtered to remove through motor traffic. Many local residents also wanted this. A decision will be given a some point by Southwark Council. From Camberwell up to Champion Hill, down the Greenway and through Dulwich Village to the Park. Small group had made good speed and we were back at 11.45, 15 min early. Four of us retired to the Cafe for a reviving drink and some excellent sweet potato chips. Route at https://goo.gl/Kz7wjr or gpx file below. 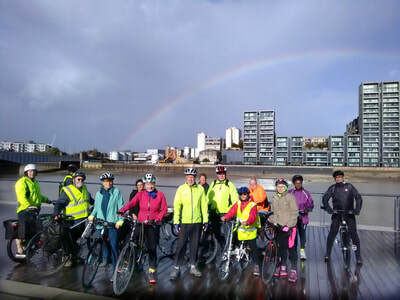 15 Riders, including 2 new faces, at Peckham Square on a pleasant autumn morning. Traced a complex route along Brayards Rd and past the lower end of Telegraph Hill park. Worked quite well in avoiding any really steep stuff. Then down to Vulcan Rd and up to Wickham Rd, across Lewisham Way and down to Brookmill Park. After a longish stretch of road, nice to get on a path through the park. Up and over the bridge at Elverson Road DLR station then a new route up to Blackheath. This involved riding through the Silk Works development, past Tesco and across to Granville Park. Road works at the entrance to Granville Park required us to walk a short bit, but meant that the lower section of Granville Park was effectively traffic free. Granville Park is a longer, but less steep, way up than our usual route up Morden Hill. But still a challenge for some. Across Blackheath on quiet roads and paths to Greenwich Park where we had a short loo break by the Blackheath Ave entrance. Return route is mostly cycle path of very quiet streets with very few stop lines. Down though the park on The Avenue, across to Straightsmouth and on to Greenwich DLR station. Carefully through the underpass and on to Quietway 1. Ended up following this all the way to Oxley Close. 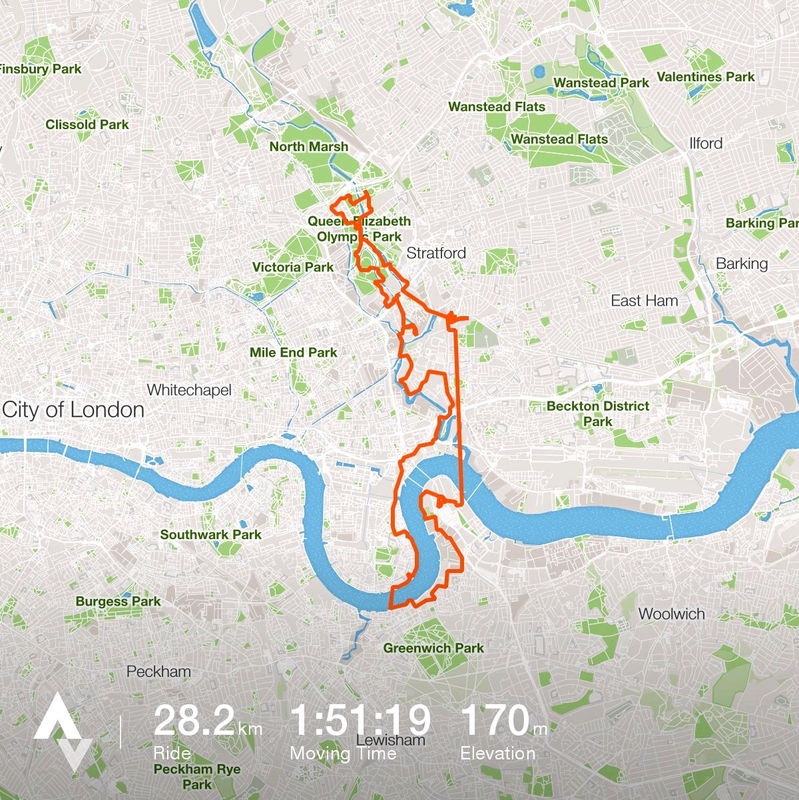 This extended the ride a bit but had the advantage of avoiding the difficult crossing of the Old Kent Rd at Ilderton Rd (note both routes are shown on the Google Map, link below, but only the Ilderton Rd one on the GPX file). Back at Peckham Square on time with the sun breaking though. About 10 miles. Route at https://goo.gl/itW2R4 or GPX file below. Idea was to explore a bit further west on the south side of the river. Met at Burgess Park with heavy showers falling on us, and Storm Brian forecast to blow us off our bikes. So nice to see 19 riders ready for this. Headed off towards Myatts Fields with, as usual, David taking the key position of rear gunner, keeping everyone up to speed and getting them across the crossings. 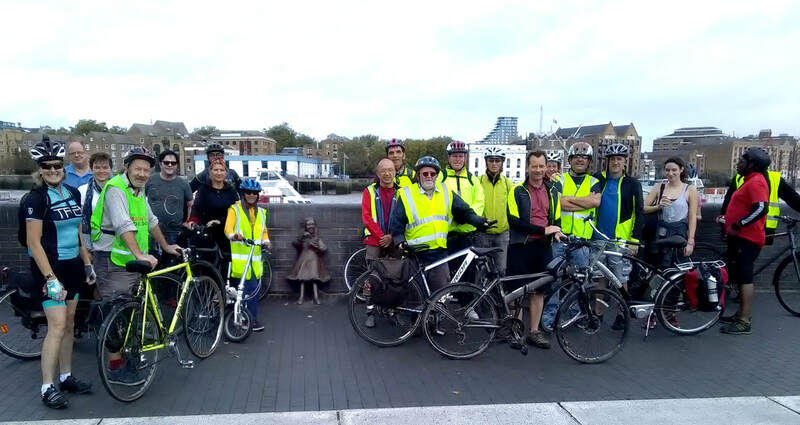 At the London Cycling Campaign AGM/Awards Event on Oct 19th David had been awarded a "Highly Commended" in the Rides category for his long service helping with, and regularly leading, Healthy Rides (Applause all round). From Myatts Fields on to Larkhall Park and Battersea Park. 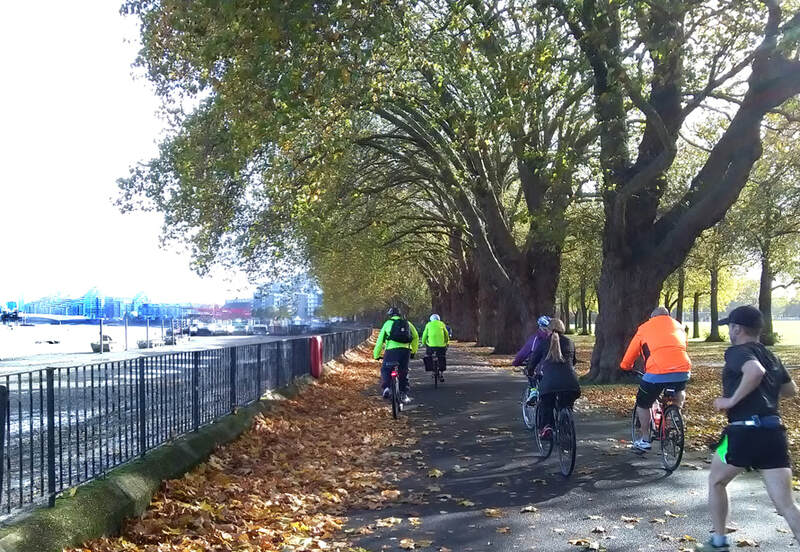 Then round Battersea Park and on to the nice paths along the Battersea and Wandsworth riverside. Here Jill had a puncture. The main group found a sunny patch (yes sun was now out) by the river and some photos were taken. These included some good ones of a rainbow - so there was still rain about. Finally reached Vauxhall Park pretty much on time. 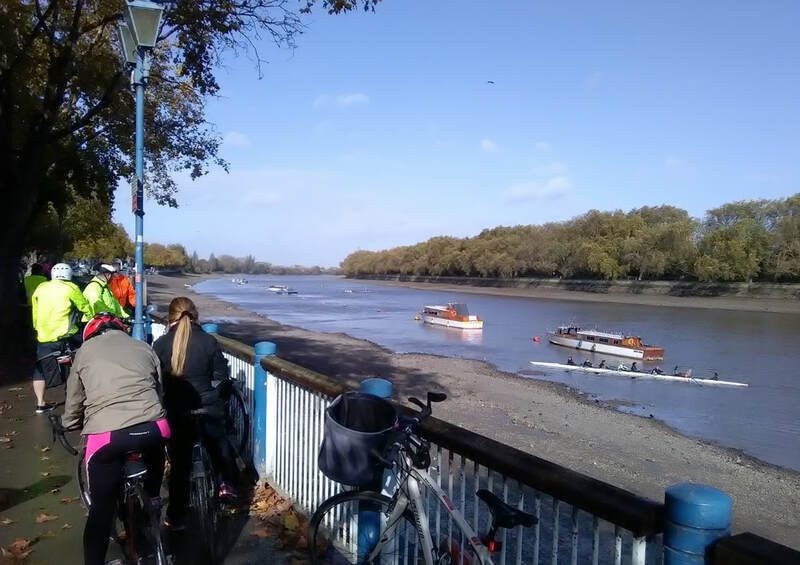 About half the group opted to miss coffee and have a quick ride on to the Putney riverside. Plenty of rowers out desite the blustery conditions. Back to Vauxhall Park to find the others only half way though their lattes (or in Bill's case, only a third of the way through a huge sandwich!). Eventually set off back along a route of great contrasts. Back along the river to the bridge over Bell Lane Creek, the mouth of the River Wandle. Then south into Wandsworth town centre along shared use pavement and across cycle crossings to avoid some of the traffic on the 1-way system. Took a while for the group to negotiate all the crossings, but eventually reached King George’s Park with its nice path by the Wandle. At the south end of the park, turned left and start heading home via Wandsworth and Clapham Commons. Nice tail wind for some of the upgrades, although occasional gusts at corners or past buildings were noticeable. 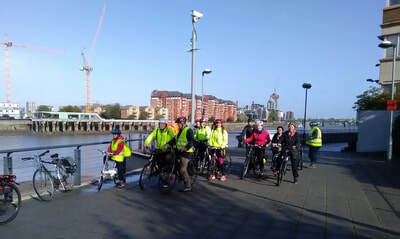 Anyway, making good time until we were just on to Wandsworth Common and realised some of the group were missing. They had shot past the turning at Alma Terrace. Phone calls found them well towards Clapham Common on an alternative route, so we met up at the Bandstand. 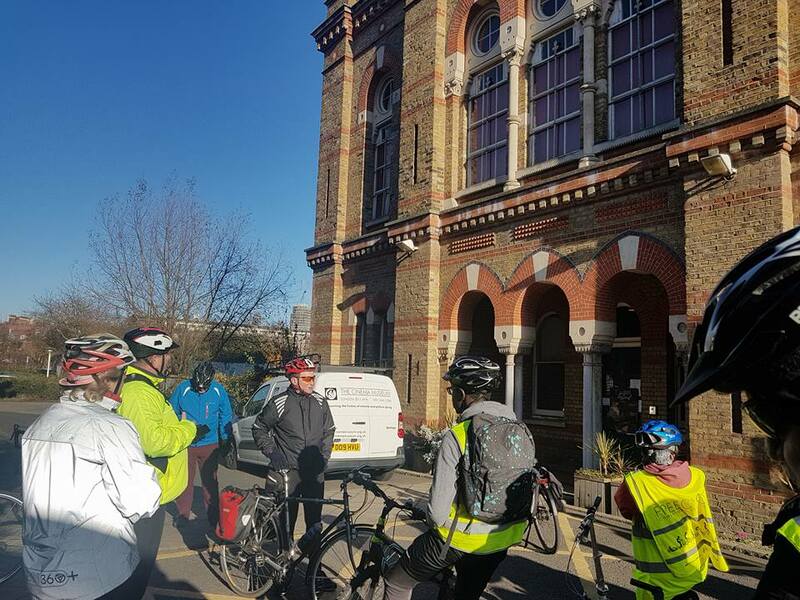 Across the Common, down CS7 to Clapham North station and west along Landor Rd to join our outward route at St Micheals Church. Then Myatts Fields again and back to Burgess Park. About 10 min late, but under blue skies. Route at https://goo.gl/94U3Ve. GPX file below. 16 riders set out from Dulwich under overcast skies and a forecast of probable rain. Out via the Court Lane exit and up to the top end of Peckham Rye Park. Then down through the park and out across Peckham Rye East side to a bit of LCN25. This took us through to Linden Grove and Consort Rd and so to Rye Lane avoiding all the backed up traffic from road works at the end of Peckham Rye. 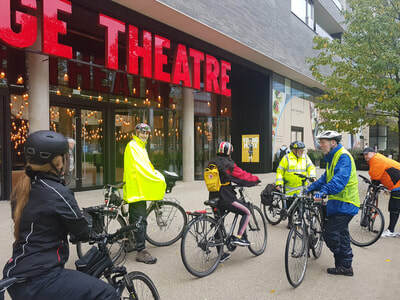 Through Peckham Square (our 4th Saturday start point and location for Southwark Cyclists fortnightly Dr Bikes) and down the canal path. Left the path at the second bridge to cross to Burgess Park via the entrance in St Georges Way, this in order to avoid the drainage works blocking the crossing of Trafalgar Rd. Across Burgess Park with lots of flowers in bloom in the garden section. From the park up Edward St and eventually through to Denmark Hill Station and across to Ruskin Park. Round the bottom of this park then back streets to Herne Hill. Walked through the tunnel under the station and entered our 5th park, Brockwell. Were in good time so sent those who wished to climb the hill and get a bit more healthy. Exited Brockwell Park at Rosendale, then via Turney and Burbage to Herne Hill Velodrome. Lots of activity as ever on a Saturday morning at the velodrome. Large group on the track, sizeable Youth Club bunch on the Mountain Bike trail and lots and lots of little cyclists learning to ride in the central area inside the track. Had time to explore a bit and found 3 large bicycles, plus riders, on the grass on the far side of the new stadium. A gent in a VC de Londres t-shirt approached us and explained the origin of these metal silhouettes. They were intended for the 2012 Olympic Opening Ceremony. He and many others had trained up to tow them, gushng fire, as part of the 2012 Opening. But at the last moment this part of the programme was dropped. 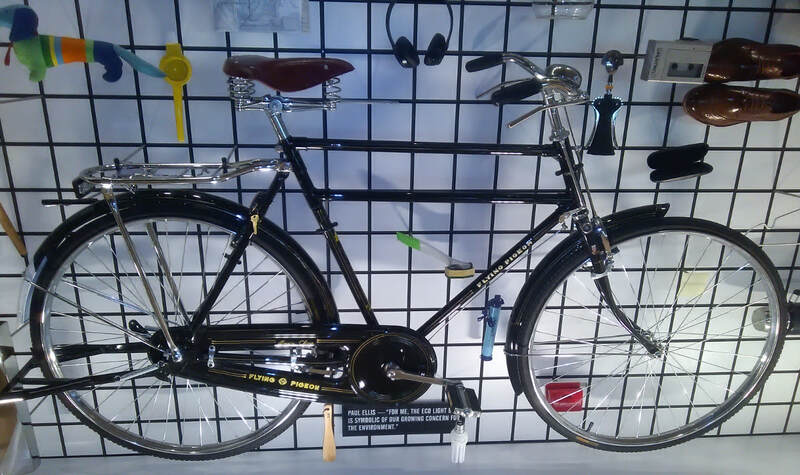 However, Herne Hill did manage to obtain 3 of the magnificent bicycles and proudly put them on display. From the velodrome just a short hop back to Dulwich Park. Would have been nicely on time except that the ride leader (me) managed to get lost. Everyone followed except David who was standing waiting for us to turn up when we eventually made it to the Cafe. And it never rained! Route at http://goo.gl/maps/hFFNL Previous ride report from May 2013 when we did the same route starting from Peckham.